Foreword – By Michael A. Peroutka Esq. And that is what is so important about the booklet in your hand by Gary and Carolyn Alder. It gives you ammunition to fight on the right side in an important political battle now raging — the fight to radically alter the form of government given us by our Founders (a Constitutional representative Republic) and change it to a pure democracy. In this battle, the Alders, have not flinched. 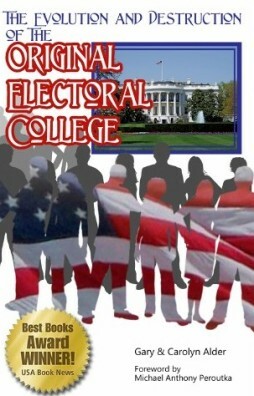 In this well-researched booklet ,the Alders make us aware of what the original Electoral College was. They believe it should be restored. They believe such a restoration would play a key role in reinstituting our original American Republic. — The role of independent electors. — How electoral votes are nominating votes. — The principle of Federalism. — How the process has been subverted by political parties. — How the 12th Amendment institutionalized party usurpation. — The empty shell we have today. So true. Our country is, in so many ways, off-the-track and going in the wrong direction. We have ignored God for generations and are reaping that whirlwind (Psalm 9:17). Because we have ignored God, oaths mean nothing anymore to most of those who take them and that means our Constitution is not taken seriously. Thank God, literally, for folks like the Alders. Thank you, Gary and Carolyn for this booklet.